Have you found the updated version of 75188 Resistance Bomber in your local area? Let us know in the comments. Hopefully they drop this guy into an Advent Calendar later on. Its kind of ridiculous right now to have him exclusive to a rare product batch. Wow, what an interesting thing for them to have done. I wonder why it was worth the effort to make this change. Maybe we'll get him in a Microfighter version of the bomber? Is there a precedent for this sort of thing? I know WALL-E had a redesigned neck bracket but I've never heard of an entirely new minifigure being designed. What an amazing spot by whoever found it! Does this mean the bomber will get a second -2 listing? I thought it was pretty rare for the inventory to be updated on a running set, let alone new box art! Is there any info available on sets that have updated inventories? One of those delicious curiosities. Finch has instantly become the most memorable part of the Resistance Bomber then. Other than the in-movie counterparts of these ships being made of wood pulp and chewing gum. Y dey do dis ? 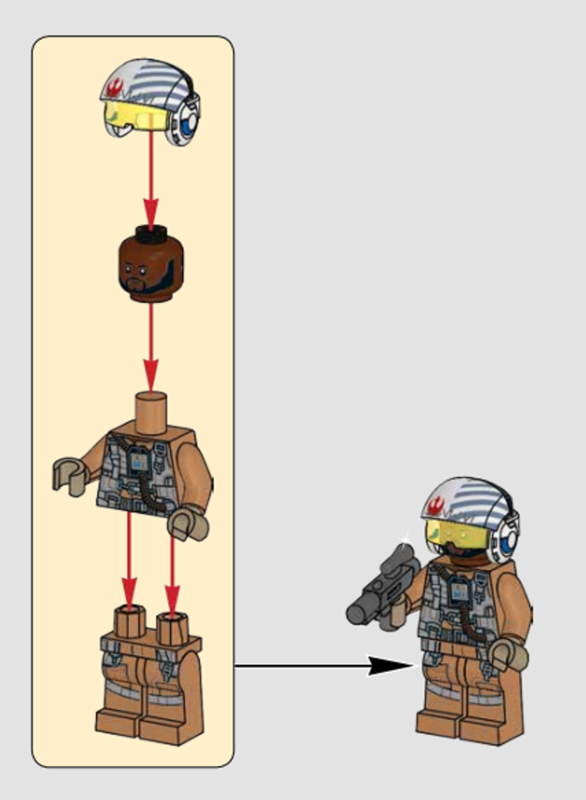 LEGO is really weird at times. It's like when they fixed an issue with the first Antman set just to have it retired pretty much the next day. What was the point? I was never able to get this set. Did they update the box art to reflect the change? I bought the Resistance Bomber from eBay after Christmas. After building it, I came here to update my collection and discovered that my Resistance Bomber Pilot didn't match the one in the database. I couldn't find anything online that matched what I had just built at my kitchen table! Every official photo of the set and fan review was different, and the box art was identical except for the minifigure substitution. I thought I was going crazy. Why would someone create such an authentic bootleg, complete with matching instructions, that improved the original set? I'm really glad I didn't leave negative feedback. Let's just hope the minifig becomes available elsewhere too. I don't understand the point of this. What benefit comes of all the effort that has to go into changing a set that's already in production? I purchased and built this set a few days ahead of The Last Jedi's release in theaters. When I saw the opening scene with the bomber I was looking for all the minifigures on-screen counterparts and noticed a black man was missing from the set. Instead LEGO offered a generic white pilot minifigure. Probably because it was unknown at the time who would be playing this perticular pilot in the movie. While I am glad to see this rectification I am also a bit sad that I bought a €100+ set and that I would have to buy another one to have a full set of minifigures. Like other have suggested - I hope LEGO releases this figure with a microfighter or advent calander. Did they change the box? Changing the minifigure to one that's based on an actual Star Wars character was the right decision in my opinion. However, I think LEGO should have had it included from the start. I prefer a more diverse selection of minifigures in Star Wars in terms of skin color and alien species than those generic faces, but that's just my opinion. Um... Lego? You feeling okay over there? If it had been within the first few weeks of the set's run, then I could have grasped it a bit more, but... this is like, over a year later. I legitimately can't understand why they'd put in all this effort to change a single minifigure, well after everyone who was interested in getting the set would have bought it already. If you bought the set before this change I would call / email LEGO and see if they send you the real character minifigure. From what I can tell, box art has been updated, but that might not be consistent. There is precedent for Lego to update sets during a production run, but it's almost always been interior or structural changes, or if minifigs are changed, it's announced. This may be the first time a minifig was changed with no announcement, and so late in a production run. Did buy my copy towards the end of last year ( November 2018?) when I heard it would retire soon. Got it via Amazon .fr, and it was still the "classic" box, with the original pilot. Strange Lego goes through all this trouble ( new fig / helmet print ; new instructions; new box art...) for a limited last batch run... It can't be a trick to clean the shelves, because clearly, until recently these updated boxes weren't even on the shelves.. Anyway, doesn't affect me that much.. only time I was a bit annoyed when they pulled a trick like this was when they decided to abort the Ultra Agents line and not market the last wave in Europe.. They should have added this guy to the First Order AT-ST or that odd walker thing that wasn't in the movie. Maybe they'd have been able to shift what I can only assume is a mountain of unsold sets. This pilot's head print looks like it'd be useful for an unmasked Black Panther. @David1985 As soon as I heard about this issue, I thought about doing that. I'll contact Customer Service after my exams next week and ask about it. This is yet another way to annoy collectors along with SDCC exclusives. I really think they will end up using this in some other set. Why go through all this trouble for a few thousand version of the set. Absurd move 4 absurd movie. As everyone is saying, this is a baffling move by Lego. Inserting a 'corrected' fig into a set already retired in some countries? Are you trying to make your fans unhappy? I think the best move would be to put Finch into a microfighter, or a SW calendar as well. Seems plenty of people would happily get this figure, but aren't so thrilled about shelling out over $100 for a set they probably already have. The change is good but it's ludicrous to think that it took them until the very last batch of production to get it into consumer hands. It was bad enough with the First Order Stormtroopers that I really wanted the new sharper mouth versions of through the Flametrooper battlepack but even half a year after the change went into effect I ordered the set fresh from Toyrus and got only old style round mouth ones. I think they wouldn't have bothered with the change if they weren't planning to reuse the head and maybe helmet. Even if they don't plan it, the calendars are obviously designed in a way to reuse overproduced parts (the old style Snowtrooper got into the 2014 calendar when months earlier the updated version was introduced in new AT-AT and Snowspeeder sets) and they will certainly have overproduced the pilot parts when the change comes into effect at the very end of production. @ Ephseb: Maybe they redid the figure because the head was designed for a set with an unmasked Black Panther for Avengers 4, it would explain why the whole thing happened so extremely late. Sounds like an early April fools joke - but I guess it's true! Very unusual by LEGO. Mystery solved! Thank you. Frustrated and disappointed in LEGO for doing something like this, UNLESS, Finch Dallow will be found in another set, in the future... I was SO uninspired by just about everything attached to The Last Jedi... (except for Heavy Assault Walker, Snoke's Throne Room & Praetorian Guard Battle Pack), it killed me to buy the set once, to have to buy a second time, for a single figure or go to eBay to get robbed is... so unlike LEGO, to have not considered this. .... uh, why are you buying it if you don't like it? Or is it the resistance bomber pilot that will become highly sought after? Especially if this Finch Dallow is found in future sets. Can't find any in the U.S. Target and Wal-mart are sold out of the set. Lego.com is still showing old box art(not sure if which version of set would be received if purchased). Nobody on Ebay is even selling this figure. I suspect a large portion of people wouldn’t notice or care, and would have no idea any change was made. Plus it’s a set that many may not have cared about from a movie many didn’t seem to care about lol. It’s a very interesting change to say the least. It's out of stock on customer service sadly. I am literally building this set at this moment. Has there been much backlash for getting the ethnicity of the actor so wrong? I wasn't aware of any but that doesn't necessarily mean very much. A polybag promotion would have been an easy solution to this mistake & would also have appealed to people who either don't want or own the ship. They could have even bundled it with the set when people bought it at [email protected], which would have driven sales. At least TLG is consistent, at making odd decisions that is. I really liked the Resistance Bomber but never liked the price, and thought if I saw it on good sale (like how I got First Order Star Destroyer for 80.00) would pick it up. Now if I can find a version w/this little dude and on sale it will be a "decision piece!" That’s extremely interesting. I got this set for Christmas in 2017, which wasn’t too long after the release. I don’t remember getting him, but I’ll have to check. I wonder if they’ll produce a polybag with him to have a wider release for his figure. @natro220, thanks for the info. I checked into it, but 10.00 off isn't really the kind of sale I was hoping and waiting for. If it comes down to 80.00 or less I'll pull the trigger, and thus withstand the wrath of the misses (as it would require a big break in the "no more LEGO's until my bday" promise). Should have just plunked in a future microfighter. As odd as the extent of the replacement is I kind of admire the commitment on TLG's end. The mini strikes me as a tertiary enough character to not be worth losing sleep over unless one already has everything else SW has to offer. So will Lego also now release a new version of the Cloud Swoop Bikes set with a printed head for Enfys Nest?? Additional info from the Eurobricks thread that discovered this: the change was made in September, and the box was changed too. Amazon US has two different listings for the two different versions, but they apparently dont consistently ship the right one. Your best best is to find a store that still has stock, and just... look at the boxes. As for calling customer support, people have had mixed results, apparently a lot of countries just dont have any stock of the fig left, and since it was only discovered recently, as far as Im aware no one's actually received one from customer support yet. Reminds me of how they redesigned a couple of the light-up lightsaber sets back in the mid-2000s to replace the press-down head minifigs with normal minifigs. But at least those were still the same character. This is an unusual move, especially since the set is so uncommon on shelves these days, and the character is so obscure. Interesting nonetheless. Only one has sold so far on BrickLink - but for $196.22! I guess I got really lucky buying one last month on eBay for $14. I was skeptical at the time, but I loved the character in the movie (albeit a small role), and the Minifigure and helmet were spot on. If you can laugh at this, good on you. If it makes you angry, try to imagine explaining to a non-AFOL why you are getting angry about a little toy man. If you think you could do a better job running Lego, get a job there, get promoted and take charge. That's what the people running Lego did. If you need to collect every single figure, try saying to yourself "I don't need to collect every single figure". If you still need to collect every figure, you'll find the money somehow. Does anyone know if the box changed? Does anyone know how to tell which version you have without opening the box? The version on shop.lego doesn't even have the new mini fig, ridiculous! This is an inconvenience, but I can wait. Chances are good he might show up in an Advent calendar yet. It looks to me very much from the comments that this change was in fact made months ago and only recently reported, which changes the story a little. Four or five months of production is a lot more reasonable on LEGO's part (if still crazy after a year!) than one or two. If Toys R Us was still open, I'm sure we'd have dozens of these sitting out! Some are frustrated with this move by Lego. I am however happy they did this! Not happy that I have to buy another set though. Ideally there would be a better way to get the updated minifig, but I made the additional set purchase because it was worth it for me. When Lego initially created the set they did not have the full details. The source material that is provided to them prior to movie releases is not always accurate. They don't get a copies of the movies. So sometimes they miss things... But this time they're actually making a correction! Some of the info here is just me echoing the email response I recieved from Lego. I sent inquiry because set pictures on Lego Shop have not been updated. Lego confirmed that the purchase of a 75188 from Lego Shop (US) will come with the updated Finch Dallow! For those interested in the states check out your closest legoland or lego discovery center. I picked one up on clearance today for $85 in Plymouth Mtg, PA. Can confirm all box art reflects new fig. @AddictedToStyrene "If you can laugh at this, good on you. If it makes you angry, try to imagine explaining to a non-AFOL why you are getting angry about a little toy man." Of course I, and others can laugh it off...but that isn't the point. The point is that they should have released as a poly bag or something, not created a 'chase' figure in a set that 90% of LEGO Star Wars fans either have or wouldn't want in the first place, never mind...twice. As for, "If you think you could do a better job running Lego, get a job there, get promoted and take charge. That's what the people running Lego did." Yes! I could certainly run it better, but no thanks. Own my own businesses, advise firms larger than LEGO will likely ever grow to be. They are one of my favourite omni-channel brands, but...everyone has room for improvement. Their biggest problem, beyond LEGO Ideas - they don't listen to their fans. "If you need to collect every single figure, try saying to yourself 'I don't need to collect every single figure'. If you still need to collect every figure, you'll find the money somehow." It's not about money at all, it's the principle. This brand has 2 sets of consumers and they do a poor job pleasing the ones who consistently dump $3-10K per year on toys. Your overall points are sound... but again, that's not the point of being a collector, is it? It looks like even this new minifigure has two variations? Some pictures I saw show the helmet with blue stripes, while some with grey stripes.